Could Dazer Lasers replace 'less lethal' Taser weapons? Forget phasers on stun, American military and police forces are about to set their lasers on daze, with the launch of two new laser guns. The non-lethal laser weapons emit "eye-safe" (hmmm...) green laser light to temporarily blind people at a range of up to 2400 metres (about a mile and a half). The Dazer Laser Guardian looks a little like a light sabre, with a 15cm straight design that can dazzle at up to 100 metres from a target. The lithium-ion battery powered laser can be adjusted to create a larger or smaller Dazer Zone that it is claimed instantly "temporarily impairs vision and balance", as well as creating a feeling of motion sickness. 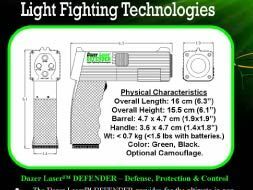 The higher-powered Dazer Laser Defender looks more like your typical sci-fi ray-gun, with a pistol design and a powerful laser that can reach over a mile. Both lasers can be mounted on pistols or shotguns if your target is wearing sunglasses. Because they can be fired continuously, if the holder misses they can continue to aim the beam at the someone's face until they hit the target, unlike other non-lethal weapons that have to be reloaded and only work at close range. The laser weapons are intended for use in subduing terrorists, anti-piracy actions and by all branches of the military. Dazer Laser also suggests, more worryingly, that they be used by security guards "in lieu of providing a lethal force weapon" or in police actions where "bystanders may be 'dazed' with full recovery". Yes, it's certainly about time those pesky bystanders got what's coming to them.